In the past several years China has been stepping up their game in every industry from infrastructure planning, technology, and finances. That’s why it is no surprise they are working hard to boost their military capacity and capabilities as well. Last month, China released a computer generated image of J-31 stealth fighter launching a long range ramjet BVRAAM (beyond-visual-range air-to-air missile). They are currently testing ramjet engine models making this imagine concept a reality. China is working hard to improve their military capabilities and technology, starting with the development of a hypersonic weapon that has more than triple the range of their current air-to-air missiles. The ramjet engine in the works gives the already deadly missiles a farther launch, a higher speed, and easier manuverability. On May 31st, the Science and Technology Daily confirmed that the 4thResearch Institure of the China Aerospace Science and Technology Coporation (CASC) has successfully tested this ramjet engine desiged to power air-to-air missiles, not once but twice. This hypersonic engine has speeds at a minimum of 3,835 miles per hour. CASC has been looking into this technology since 2000. One of the main design complications was finding a solid fuel to power the ramjet. A solid fuel was prefered for convenience of use. The ramject could be launched on demand without having to fuel their tanks prior to launch. 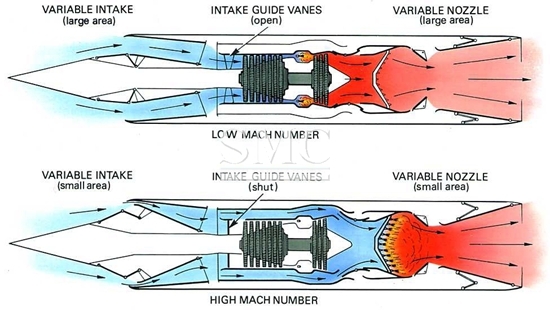 The speed and burn rate of the engine are controlled by manipulating the ramjet’s air intakes. The new ramjet also carries more propellants than most similarly sized rockets. This is because they use atmospheric oxygen to burn fuel instead of carry onboard oxidizers. Because of the enhanced speed and range of this missile it has a larger “no escape” zone, meaning that the target cannot outrun the missile. The new ramjet BVRAAM’s capabilities compared to the exsisting and planned air-to-air missiles are much greater. The current U.S. BVRAAM is called AMRAAM AIM-120D, it has an active radar seeker, two way datalink, and top speeds of about a Mach 4. The CASC ramjet has speed capabilities of a Mach 5 or higher. The U.S.’s DARPA Triple Threat Terminator (T3) would have been close competition to the CASC ramjet, however, even after test flights the T3 does not have a development program due to lack of funding. The U.S. does intend to further their advanced missile capabilities by 2030, but with the same 100 mile range. CASC’s ramjet is one of a kind and the best of its kind, posing a serious threat for anyone trying to go against China’s military force.